American forces departed Iraqi cities last week to parades, fireworks, and chants of "Out, America, out!" and "America has left! Baghdad is victorious!" 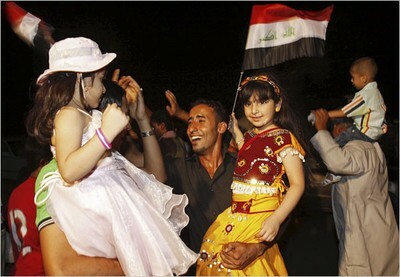 Iraqis celebrated the withdrawal of U.S. soldiers from Iraqi cities on July 1. They left under a Status of Forces Agreement reached in November 2008 stipulating their "withdrawal from cities, towns and villages" by June 30, 2009. In addition, by December 31, 2011, "All U.S. forces are to withdraw from all Iraqi territory, water and airspace." The SOFA also grants Baghdad control over American military operations and it defines the U.S. role in such areas as Iraq's economy and education. Some urban U.S. fortifications were turned over to Iraqis, others razed. As Capt. Andrew Roher put it, while standing on a commercial street in central Baghdad, watching his small base being obliterated, "Leave no trace is the goal." American troops have moved to tent and plywood "installations" (don't call them "bases") outside the cities. These changes signify, in short, that the Iraqis, despite six-plus years of U.S.-led occupation and their still requiring substantial U.S. support, are more-or-less finally running their own country. For me, the American move to the countryside comes six years too late. Already in a 2003 article, "Let Iraqis run Iraq," I advised: "Turn power over to the Iraqis. Let them form a government. … Take coalition forces off their patrols of city streets and away from protecting buildings, and put them in desert bases." Washington's long delay has cost Americans heavily, starting with thousands dead and hundreds of billions of dollars, then going on to poisoning American politics. Tying American interests to the welfare of urban Iraqis shattered the post-9/11 "united we stand" solidarity and replaced it with the country's most fractious and vicious debate since the Vietnam War. Worse, occupying Iraqi cities has a yet-incalculable but frightening long-term impact. More than any other factor, taking responsibility for Iraqi cities discredited George W. Bush and built the groundswell of support that swept the furthest left-wing politician ever to the presidency. Barack Obama's first half-year in office suggests that he aspires to make fundamental changes in the relationship of state and society; in this sense, Americans for many decades will likely pay for mistakes made in Iraq. And what about the impact of the occupation on Iraqis? As Ernesto Londoño of the Washington Post notes, two questions haunted U.S. troops as they prepared for the June 30 pullout: How will Iraqi forces behave after they leave? Will the American lives and treasury spent to prop up and legitimize the Iraqi government prove to have been a good investment? I am pessimistic, seeing Iraq as a historically violent country yet emerging from the Stalinist nightmare of Saddam Hussein, a place replete with corruption, tension, hatred, and desire for revenge. Having American troops around for six years temporarily contained the pressures but will barely ameliorate the country's fate. But the troops are inexorably leaving and, I predict, the massive American effort will rapidly dissolve, fail, and be forgotten. Iraqis will deal poorly with such problems as terrorism, Sunni-Shiite tensions, Kurdish autonomy, Islamist ambitions, disappearing Christians, a fragile Mosul Dam, and an obsolete oil and gas infrastructure. Civil war remains a live prospect as sectarian fighting returns. Current evidence indicates that Iraqis cannot even maintain their billions of dollars worth of U.S.-donated military equipment. As an American, I say good luck to Iraq but good riddance to U.S. control of its cities, goodbye to oversight of the economy and schools, farewell to worrying about inter-tribal relations and the Mosul Dam, and adieu to responsibility for terrorists and their victims. Ironically, while occupation of Iraqi cities did deep and lasting damage to the United States, its beneficial impact on Iraq will likely be superficial and transient. In all, a painful waste of resources is winding down none too soon. July 19, 2009 update: For more pessimism of mine, see "Predicting Iraq's Future."